Frozen yogurt is like coffee: You’re happy with a mediocre iteration until you stumble upon the craft version and then the course of your life is forever altered partly because how did you even live before discovering well-pulled espresso but mostly because everyone will start referring to you as a “snob” although whatever because Starbucks and Yogurtland are garbage and you don’t need to defend your life choices to anyone. In service of that idea, there is a new-ish storefront in L.A. serving the single-origin equivalent of froyo, and in the words of Angelica Schuyler, I’m about to change your life. 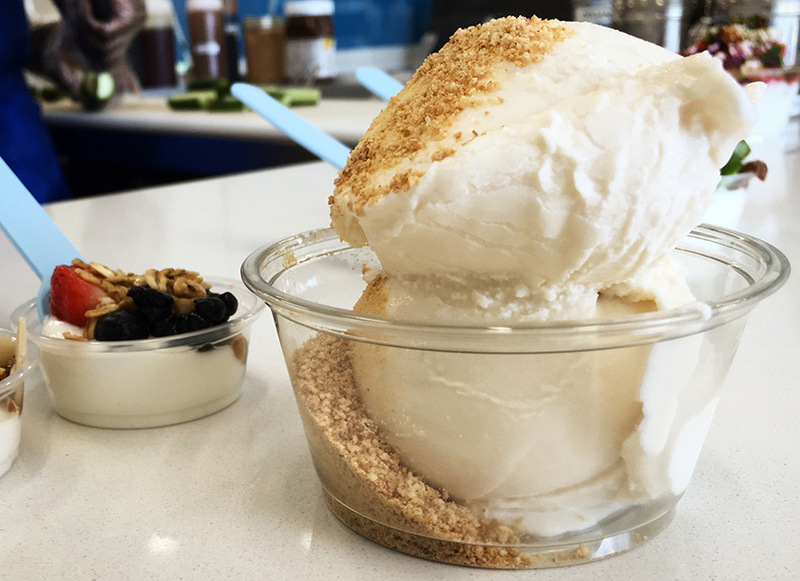 Last July, Zorbey Ozdilek quietly opened Moo Greek Yogurt along a stretch of San Vicente Boulevard in Brentwood. Ozdilek’s original concept was built on the idea of Greek yogurt bowls, these hefty servings of thick, strained, unsweetened yogurt topped with either savory or sweet accoutrements (for savory, think cucumbers, olive oil, basil, tomatoes; for sweet, think fresh fruit, local and imported jams, chia seeds, and dates). Here’s where I’ll insert myself into this narrative. 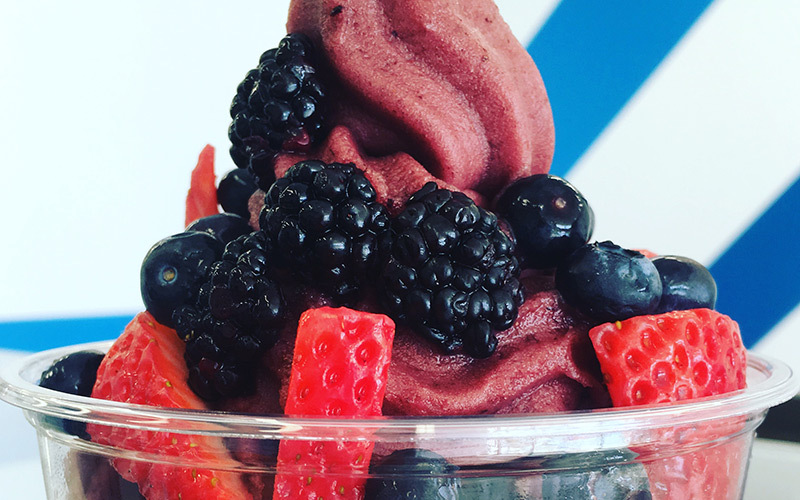 I have eaten a lot of frozen yogurt in my day, and Moo’s is not your average offering. The Greek yogurt base makes for a product that is creamy and smooth, not overly sweet, and, most notably, fresh. When served by itself, the yogurt at larger chains often carries a weird chemically aftertaste, but you can easily mask it by adding a strong pour of rainbow sprinkles, nearly a full sleeve of Oreos, whipped cream, caramel, mochi, fruit, granola, and cookie dough. This is also why you don’t notice or care that Starbucks’ coffee is persistently over roasted—go heavy enough with cream, sugar, and flavored syrups, and you can trick yourself into liking anything. Alone, Moo’s frozen yogurt is sublime, with the toppings being the equivalent of a Bonus Room: a perk, but not a necessity. Every flavor is made in-house in small batches, which is of utmost importance in terms of quality control. The shop offers four varieties, three of which are permanent and one that rotates. For the rest of the month, you can get Original Tart, Dark Chocolate, Salted Caramel Pretzel, and Acai Blueberry. You’ll do well to order the Salted Caramel Pretzel. Besides froyo, Ozdilek also makes small batches of Greek yogurt gelato in the store, which by his estimation is the first of its kind anywhere. He uses a traditional Italian technique but substitutes the cream with Greek yogurt. “It’s lower in fat, tangy, and lighter—and a lot higher in protein,” he says. At the moment, Ozdilek only has the bandwidth to make one type of gelato per day, so the flavor is always a surprise. Some of his signatures include Carrot Cake, Strawberry White Chocolate, and Mint Chocolate Chip, all made with fresh ingredients (meaning your mint ice cream will be white, not green). Moo’s Greek yogurt gelato is possibly the first of its kind in the world. So next time you’re considering supporting Big Froyo, reconsider, then go to Moo. Next articleThe Most Instagram-Worthy Murals in L.A.